To perform predictor variable selection for a Bayesian linear regression model, see estimate. PosteriorMdl = estimate(PriorMdl,X,y) returns the model that characterizes the joint posterior distributions of β and σ2 of a Bayesian linear regression model. PriorMdl specifies the joint prior distribution of the parameters and the structure of the linear regression model. X is the predictor data and y is the response data. PriorMdl and PosteriorMdl might not be the same object type. To produce PosteriorMdl, the estimate function updates the prior distribution with information about the parameters that it obtains from the data. NaNs in the data indicate missing values, which estimate removes by using list-wise deletion. PosteriorMdl = estimate(PriorMdl,X,y,Name,Value) uses additional options specified by one or more name-value pair arguments. For example, you can specify a value for one of β or σ2 to estimate the conditional posterior distribution of one parameter given the specified value of the other parameter. If you specify Beta or Sigma2, then PosteriorMdl and PriorMdl are equal. The next two syntaxes will be removed in a future release. For more details, see Compatibility Considerations. If you specify Beta or Sigma2, then estimate returns conditional posterior estimates. Otherwise, estimate returns joint posterior estimates. [PosteriorMdl,estBeta,EstBetaCov,estSigma2,estSigma2Var,Summary] = estimate(___) also returns a table that contains the following for each parameter: posterior means and standard deviations, 95% credible intervals, posterior probability that the parameter is greater than 0, and a description of the posterior distribution (if one exists). Consider a model that predicts the fuel economy (in MPG) of a car given its engine displacement and weight. Load the carsmall data set. Regress fuel economy onto engine displacement and weight, including an intercept to obtain ordinary least-squares (OLS) estimates. Create a default, diffuse prior distribution for one predictor. PriorMdl is a diffuseblm model object. Use default options to estimate the posterior distribution. PosteriorMdl is a conjugateblm model object. The posterior means and the OLS coefficient estimates are almost identical. Also, the posterior standard deviations and OLS standard errors are almost identical. The posterior mean of Sigma2 is close to the OLS mean squared error (MSE). Consider the multiple linear regression model that predicts the US real gross national product (GNPR) using a linear combination of industrial production index (IPI), total employment (E), and real wages (WR). is a 4-D t distribution with 30 degrees of freedom for each component, correlation matrix C, location ct, and scale st.
, with shape and scale . bayeslm treats these assumptions and the data likelihood as if the corresponding posterior is analytically intractable. %   the two evaluated densities. %           first m-1 elements of params. %           correspond to the elements of params(1:end-1). %           columns correspond to the elements of params(1:end-1). %        a: Inverse gamma shape parameter, a positive numeric scalar. %        b: Inverse gamma scale parameter, a positive scalar. Create an anonymous function that operates like priorMVTIG, but accepts the parameter values only, and holds the hyperparameter values fixed to arbitrarily chosen values. Create a custom joint prior model for the linear regression parameters. Specify the number of predictors p. Also, specify the function handle for priorMVTIG and the variable names. PriorMdl is a customblm Bayesian linear regression model object representing the prior distribution of the regression coefficients and disturbance variance. Load the Nelson-Plosser data set. Create variables for the response and predictor series. Estimate the marginal posterior distributions of and using the Hamiltonian Monte Carlo (HMC) sampler. Specify drawing 10,000 samples and a burn-in period of 1000 draws. PosteriorMdl is an empiricalblm model object storing the draws from the posterior distributions. View a trace plot and an ACF plot of the draws from the posterior of (for example) and the disturbance variance. Do not plot the burn-in period. 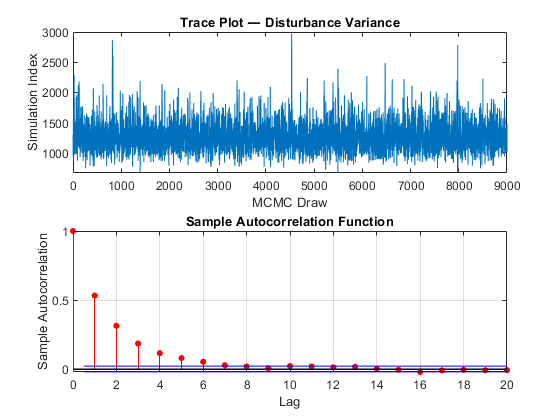 The MCMC sample of the disturbance variance appears to mix well. Consider the regression model in Estimate Posterior Using Hamiltonian Monte Carlo Sampler. This example uses the same data and context, but assumes a diffuse prior model instead. Create a diffuse prior model for the linear regression parameters. Specify the number of predictors p and the names of the regression coefficients. Estimate the conditional posterior distributions of β given the data and that σ2=2. Warning: Current syntax supports 6 output arguments, and will be removed in a future release. For supported output arguments, see <a href="matlab:helpview(fullfile(docroot,'econ','econ.map'),'blmestimate')">estimate</a>. estimate returns the 4-by-1 vector of means (condPostMeanBeta) and the 4-by-4 covariance matrix (CondPostCovBeta) of the conditional posterior distribution of β given that data and that σ2=2. Also, estimate displays a summary of the conditional posterior distribution of β. Because σ2 is fixed during estimation, inferences on it are trivial. The warning indicates that, in a future release, the syntaxes of estimate will change. At this time, do not update your code. For more details, see Replacing Discouraged Syntaxes of estimate. Because estimate computes the conditional posterior distribution, it returns the original prior model, not the posterior, in the first position of the output argument list. Estimate the conditional posterior distributions of σ2 given that β is condPostMeanBeta. estimate returns the mean (condPostMeanSigma2) and variance (CondPostVarSigma2) of the conditional posterior distribution of σ2 given the data and that β is condPostMeanBeta. In the display, inferences on β are trivial. Consider the regression model in Estimate Posterior Using Hamiltonian Monte Carlo Sampler. This example uses the same data and context, but assumes a semiconjugate prior model instead. Create a semiconjugate prior model for the linear regression parameters. Specify the number of predictors p and the names of the regression coefficients. PriorMdl is a semiconjugateblm model object. PosteriorMdl is an empiricalblm model object because marginal posterior distributions of semiconjugate models are analytically intractable, so estimate must implement a Gibbs sampler. Summary is a table containing the estimates and inferences that estimate displays at the command line. Access the 95% equitailed credible interval of the regression coefficient of IPI. Bayesian linear regression model representing a prior model, specified as an object in this table. PriorMdl can also represent a joint posterior model returned by estimate, either a conjugateblm or empiricalblm model object. In this case, estimate updates the joint posterior distribution using the new observations in X and y.
Predictor data for the multiple linear regression model, specified as a numObservations-by-PriorMdl.NumPredictors numeric matrix. numObservations is the number of observations and must be equal to the length of y. Response data for the multiple linear regression model, specified as a numeric vector with numObservations elements. Example: 'Sigma2',2 specifies estimating the conditional posterior distribution of the regression coefficients given the data and that the specified disturbance variance is 2. Flag to display Bayesian estimator summary at the command line, specified as the comma-separated pair consisting of 'Display' and a value in this table. true estimate prints estimation information and a table summarizing the Bayesian estimators to the command line. false estimate does not print to the command line. The estimation information includes the estimation method, fixed parameters, the number of observations, and the number of predictors. The summary table contains estimated posterior means and standard deviations (square root of the posterior variance), 95% equitailed credible intervals, the posterior probability that the parameter is greater than 0, and a description of the posterior distribution (if known). If you specify one of Beta or Sigma2, then estimate includes your specification in the display, and corresponding posterior estimates are trivial. Value of the regression coefficients for conditional posterior distribution estimation of the disturbance variance, specified as the comma-separated pair consisting of 'Beta' and a (PriorMdl.Intercept + PriorMdl.NumPredictors)-by-1 numeric vector. estimate estimates the characteristics of π(σ2|y,X,β = Beta), where y is y, X is X, and Beta is the value of 'Beta'. If PriorMdl.Intercept is true, then Beta(1) corresponds to the model intercept. All other values correspond to the predictor variables that compose the columns of X. Beta cannot contain any NaN values (that is, all coefficients must be known). You cannot specify Beta and Sigma2 simultaneously. By default, estimate does not compute characteristics of the conditional posterior of σ2. Value of the disturbance variance for conditional posterior distribution estimation of the regression coefficients, specified as the comma-separated pair consisting of 'Sigma2' and a positive numeric scalar. estimate estimates characteristics of π(β|y,X,Sigma2), where y is y, X is X, and Sigma2 is the value of 'Sigma2'. You cannot specify Sigma2 and Beta simultaneously. By default, estimate does not compute characteristics of the conditional posterior of β.
Monte Carlo simulation adjusted sample size, specified as the comma-separated pair consisting of 'NumDraws' and a positive integer. estimate actually draws BurnIn – NumDraws*Thin samples. Therefore, estimate bases the estimates off NumDraws samples. For details on how estimate reduces the full Monte Carlo sample, see Algorithms. If PriorMdl is a semiconjugateblm model and you specify Beta or Sigma2, then MATLAB® ignores NumDraws. Number of draws to remove from the beginning of the Monte Carlo sample to reduce transient effects, specified as the comma-separated pair consisting of 'BurnIn' and a nonnegative scalar. For details on how estimate reduces the full Monte Carlo sample, see Algorithms. To help you specify the appropriate burn-in period size, determine the extent of the transient behavior in the Monte Carlo sample by specifying 'BurnIn',0, simulating a few thousand observations using simulate, and then plotting the paths. Monte Carlo adjusted sample size multiplier, specified as the comma-separated pair consisting of 'Thin' and a positive integer. The actual Monte Carlo sample size is BurnIn + NumDraws*Thin. After discarding the burn-in, estimate discards every Thin – 1 draws, and then retains the next. For details on how estimate reduces the full Monte Carlo sample, see Algorithms. To reduce potential large serial correlation in the Monte Carlo sample, or to reduce the memory consumption of the draws stored in PosteriorMdl, specify a large value for Thin. Starting values of the regression coefficients for the Markov chain Monte Carlo (MCMC) sample, specified as the comma-separated pair consisting of 'BetaStart' and a numeric column vector with (PriorMdl.Intercept + PriorMdl.NumPredictors) elements. By default, BetaStart is the ordinary least-squares (OLS) estimate. A good practice is to run estimate multiple times using different parameter starting values. Verify that the solutions from each run converge to similar values. Starting values of the disturbance variance for the MCMC sample, specified as the comma-separated pair consisting of 'Sigma2Start' and a positive numeric scalar. By default, Sigma2Start is the OLS residual mean squared error. Reparameterization of σ2 as log(σ2) during posterior estimation and simulation, specified as the comma-separated pair consisting of 'Reparameterize' and a value in this table. false estimate does not reparameterize σ2. true estimate reparameterizes σ2 as log(σ2). estimate converts results back to the original scale and does not change the functional form of PriorMdl.LogPDF. If you experience numeric instabilities during the posterior estimation or simulation of σ2, then specify 'Reparameterize',true. MCMC sampler, specified as the comma-separated pair consisting of 'Sampler' and a value in this table. To increase the quality of the MCMC draws, tune the sampler. If you specify the HMC sampler, then a best practice is to provide the gradient for some variables, at least. estimate resorts the numerical computation of any missing partial derivatives (NaN values) in the gradient vector. Sampler options, specified as the comma-separated pair consisting of 'Options' and a structure array returned by sampleroptions. 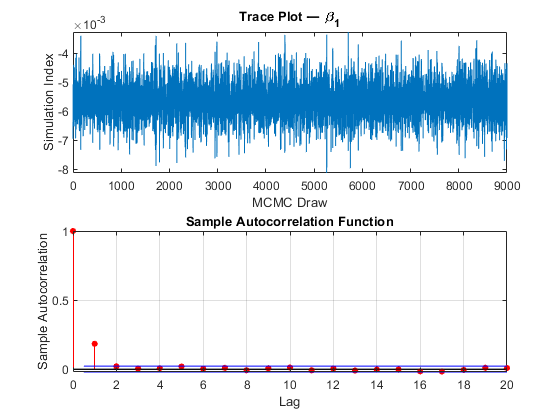 Use 'Options' to specify the MCMC sampler and its tuning-parameter values. Typical sampling-interval width around the current value in the marginal distributions for the slice sampler, specified as the comma-separated pair consisting of 'Width' and a positive numeric scalar or a (PriorMdl.Intercept + PriorMdl.NumPredictors + 1)-by-1 numeric vector of positive values. The first element corresponds to the model intercept, if one exists in the model. The next PriorMdl.NumPredictors elements correspond to the coefficients of the predictor variables ordered by the predictor data columns. The last element corresponds to the model variance. If Width is a scalar, then estimate applies Width to all PriorMdl.NumPredictors + PriorMdl.Intercept + 1 marginal distributions. If Width is a numeric vector, then estimate applies the first element to the intercept (if one exists), the next PriorMdl.NumPredictors elements to the regression coefficients corresponding to the predictor variables in X, and the last element to the disturbance variance. If the sample size (size(X,1)) is less than 100, then Width is 10 by default. If the sample size is at least 100, then estimate sets Width to the vector of corresponding posterior standard deviations by default, assuming a diffuse prior model (diffuseblm). The typical width of the slice sampler does not affect convergence of the MCMC sample. It does affect the number of required function evaluations, that is, the efficiency of the algorithm. If the width is too small, then the algorithm can implement an excessive number of function evaluations to determine the appropriate sampling width. If the width is too large, then the algorithm might have to decrease the width to an appropriate size, which requires function evaluations. estimate sends Width to the slicesample function. For more details, see slicesample. Bayesian linear regression model storing distribution characteristics, returned as a conjugateblm, semiconjugateblm, diffuseblm, empiricalblm, or customblm model object. If you do not specify either Beta or Sigma2 (their values are ), then estimate updates the prior model using the data likelihood to form the posterior distribution. PosteriorMdl characterizes the posterior distribution. Its object type depends on the prior model type (PriorMdl). If you specify either Beta or Sigma2, then PosteriorMdl equals PriorMdl (the two models are the same object storing the same property values). estimate does not update the prior model to form the posterior model. However, estBeta, EstBetaCov, estSigma2, estSigma2Var, and Summary store conditional posterior estimates. For more details on the display of PosteriorMdl, see Summary. For details on supported posterior distributions that are analytically tractable, see Analytically Tractable Posteriors. Estimated posterior mean of the regression coefficients, returned as a numeric column vector of size PriorMdl.Intercept + PriorMdl.NumPredictors. If PriorMdl.Intercept is true, then estBeta(1) is the estimated intercept, and all other elements correspond to columns of X. Otherwise, the elements correspond to the columns of X. If you do not specify Sigma2, then estBeta is the estimated mean of the marginal posterior distribution of β. Otherwise, it is the estimated mean of the conditional posterior distribution of β given Sigma2 and the data. If you specify Beta, then estBeta equals Beta. estimate will not return estBeta in a future release. For more details, see Compatibility Considerations. Estimated posterior covariance matrix of the regression coefficients, returned as a (PriorMdl.Intercept + PriorMdl.NumPredictors)-by-(PriorMdl.Intercept + PriorMdl.NumPredictors) numeric matrix. Rows and columns of EstBetaCov are correspond to the elements of estBeta. If you do not specify Sigma2, then EstBetaCov is the estimated covariance matrix of the marginal posterior distribution of β. Otherwise, it is the estimated covariance matrix of the conditional posterior distribution of β given the data and that σ2 = Sigma2. If you specify Beta, then EstBetaCov is a matrix of zeros. estimate will not return EstBetaCov in a future release. For more details, see Compatibility Considerations. Estimated posterior mean of the disturbance variance, returned as a positive numeric scalar. If you do not specify Beta, then estSigma2 is the estimated mean of the marginal posterior distribution of σ2. Otherwise, it is the estimated mean of the conditional posterior distribution of σ2 given the data and that β = Beta. If you specify Sigma2, then estSigma2 equals Sigma2. estimate will not return estSigma2 in a future release. For more details, see Compatibility Considerations. Estimated posterior variance of the disturbance variance, returned as a numeric scalar. If you do not specify Beta, then estSigma2Var is the estimated variance of the marginal posterior distribution of σ2. Otherwise, it is the estimated covariance matrix of the conditional posterior distribution of σ2 given the data and that β = Beta. If you specify Sigma2, then estSigma2Var is 0.
estimate will not return estSigma2Var in a future release. For more details, see Compatibility Considerations. Row names are the names in PriorMdl.VarNames. The name of the last row is Sigma2. Alternatively, pass PosteriorMdl to summarize to obtain a summary of Bayesian estimators. estimate will return Summary in the second output position in a future release. For more details, see Compatibility Considerations. If PriorMdl is an empiricalblm model object. You cannot specify Beta or Sigma2. You cannot estimate conditional posterior distributions by using an empirical prior distribution. A Bayesian linear regression model treats the parameters β and σ2 in the multiple linear regression (MLR) model yt = xtβ + εt as random variables. yt is the observed response. xt is a 1-by-(p + 1) row vector of observed values of p predictors. To accommodate a model intercept, x1t = 1 for all t.
β is a (p + 1)-by-1 column vector of regression coefficients corresponding to the variables that compose the columns of xt. ϕ(yt;xtβ,σ2) is the Gaussian probability density with mean xtβ and variance σ2 evaluated at yt;. Before considering the data, you impose a joint prior distribution assumption on (β,σ2). In a Bayesian analysis, you update the distribution of the parameters by using information about the parameters obtained from the likelihood of the data. The result is the joint posterior distribution of (β,σ2) or the conditional posterior distributions of the parameters. Monte Carlo simulation is subject to variation. If estimate uses Monte Carlo simulation, then estimates and inferences might vary when you call estimate multiple times under seemingly equivalent conditions. To reproduce estimation results, before calling estimate, set a random number seed by using rng. If estimate issues an error while estimating the posterior distribution using a custom prior model, then try adjusting initial parameter values by using BetaStart or Sigma2Start, or try adjusting the declared log prior function, and then reconstructing the model. The error might indicate that the log of the prior distribution is –Inf at the specified initial values. Whenever the prior distribution (PriorMdl) and the data likelihood yield an analytically tractable posterior distribution, estimate evaluates the closed-form solutions to Bayes estimators. Otherwise, estimate resorts to Monte Carlo simulation to estimate parameters and draw inferences. For more details, see Posterior Estimation and Inference. This figure illustrates how estimate reduces the Monte Carlo sample using the values of NumDraws, Thin, and BurnIn. Rectangles represent successive draws from the distribution. estimate removes the white rectangles from the Monte Carlo sample. The remaining NumDraws black rectangles compose the Monte Carlo sample. In the future release when estimate changes, you can obtain estimated marginal and conditional posterior means and covariances (estBeta, EstBetaCov, estSigma2, and estSigma2Var) from the estimation summary table Summary. You do not need to update your code now. However, you can prepare your code for the software change. For details, see Replacing Discouraged Syntaxes of estimate.